In keeping with the spirit of the holiday, it’s time to drink American…liquor, that is. Though this next cocktail tosses in a few European additions, the base spirit is good ol’ American apple brandy. What could be more apropos than cultures coming together in the form of a cocktail? This variation on the classic Brooklyn cocktail is New York all the way, and when PDT’s Jim Meehan and John Dergaon came up with it, they would have named it after a neighborhood in the cocktail’s namesake borough, but they didn’t think the world needed another Park Slope cocktail. So they looked across the Hudson River instead and cheekily named it the Newark. Laird’s is one of my favorite spirits; the Old Apple Brandy and the bottled-in-bond brandy are both excellent, the Applejack a little less so, being blended with neutral spirits, but it suffices in a pinch, and it’s a bit smoother. All three are bottled up there in New Jersey, Laird’s being the oldest family distillery in the country. Applejack has a bit of brashness to it that’s missing from the smooth, Old World calvados from France, and stands up well to bolder ingredients such as Fernet and Maraschino. In this case, the Fernet definitely makes itself known; specifically, in the form of a vaguely minty flavor, with the maraschino and sweet vermouth hiding in the background. Muddle spearmint leaves in the bottom of a double Old-fashioned glass with the brandy and syrup. Add ice and stir to chill. Add ore ice to fill, if necessary. Garnish with a sprig of mint. *Crush three 3-inch sticks of cinnamon (not cassia) in a mortar & pestle, then add to 1 cup of sugar and 1 cup of water. Heat to combine, then bottle and keep for 2-3 weeks. 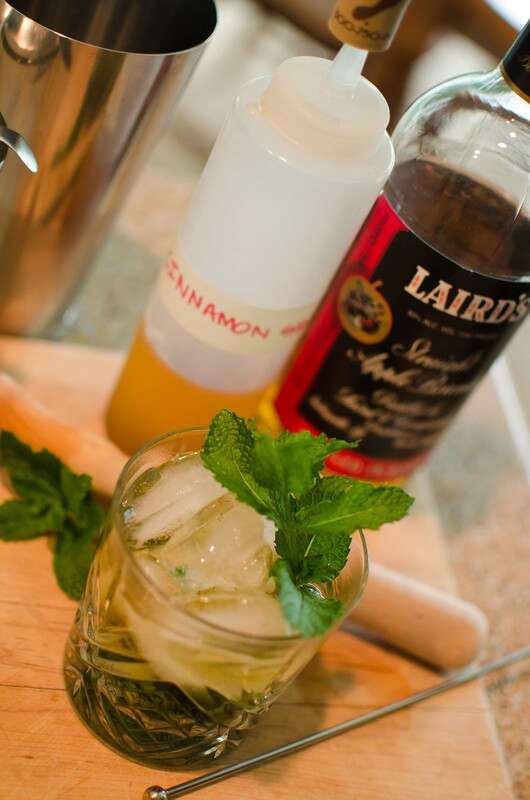 The Laird’s, cinnamon, and mint all work well together here. I’m not currently an enormous fan of the smash, which can be made with any spirit, and is what Jerry Thomas called “a julep on a short plan,” as it seems to come out a bit watered-down, though technique could certainly be a factor. The muddling expresses more of the mint flavor, which was lacking in my previous attempts at the smash (which involved shaking the mint with the other ingredients). Still, a recommended shortcut if you enjoy Mint Juleps. Anything made with apple brandy makes a perfect Autumn drink…it’ll definitely be on reserve for my favorite season. Other Fall choices? The Savoy Tango and Fallen Leaves come to mind…but I’m thinking ahead of myself. 3 months to go before cooler temperatures and red, orange, and gold leaves. 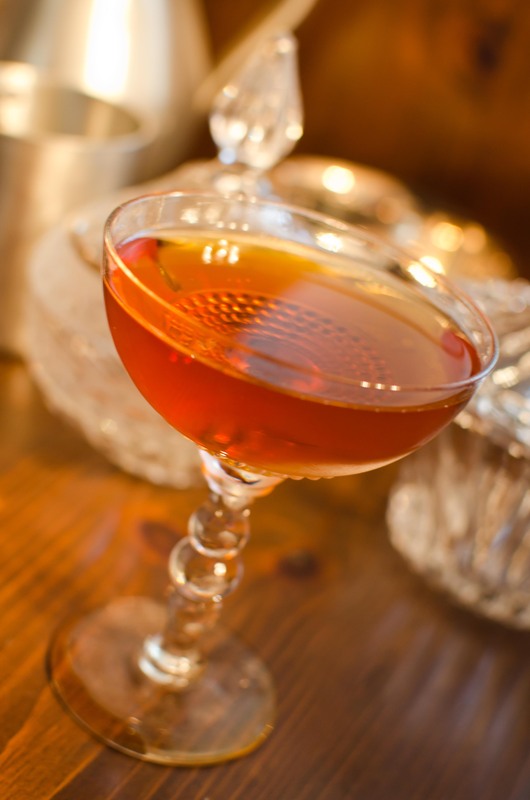 This entry was posted on July 4, 2011 by IJ Lauer in Apple Brandy, Drink Recipe, Fernet-Branca, Maraschino, Sweet Vermouth.